Project obstacles and solutions: In 2014, the joint venture, Browning/Duke, LLC announced that it was building the largest contiguous space warehouse in the Indianapolis region. AllPoints Midwest Building 6 encompasses 936,510 square feet of uninterrupted floor space. Rescom was contracted to do all of the flatwork. A floor of this size requires a concrete mix that can be placed quickly and in mass quantities. Rescom used a laser screed to level the concrete. This allowed them to finish nearly 1,000 yards of concrete per day. IMI QC/QA worked closely with the engineers at Browning to design a blended coarse aggregate mix specific to large warehouse floors. The use of a blended aggregate eliminated the need for welded steel wire fabric reinforcement in the main floor. This is typically used to control curling and plastic shrinkage cracking on large slabs. Eliminating the extra time to place the fabric, plus the labor and material savings makes a blended aggregate floor an attractive option in a large commercial slab. However, another critical part of this floor were the flatness (FF) and levelness (FL) measurements of the slab. IMI QC/QA measured slump and the concrete performance on the job site. The mix performed to achieve an average of FF80/FL60 - Very Flat rating. 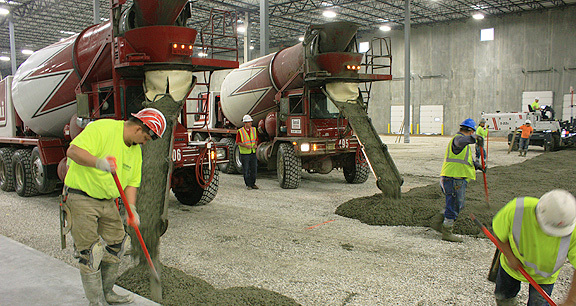 IMI supplied 24,000 yards of 4,000 psi concrete for the Building 6 floors. For more information on concrete floors, contact your sales representative. Click here.